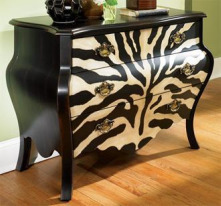 Add a bit of excitement with the enticing pattern and curves of this three Zebra drawer chest. The antique brass finish hardware is highly detailed and decorative. Curved sides, top, apron, and side rails make for a jazzy silhouette. Painted zebra animal print and black finish. Antique brass finish hardware. Three drawers. 42″wideX21deepX 32″high.